Is that a Schmidt/Mann clone or just a generic climastrologist? Nobody, I noticed, mentioned the pause in the news reports I heard this morning. Nor, indeed, the distinction between carbon and CO2, a trap that you might expect the UK's 'chief scientist' to avoid. Perhaps I should refer to water as hydrogen in future? "Perhaps I should refer to water as hydrogen in future?" I prefer the analogy of C vs CO2 as O vs OH2, and reference water as healthy, breathable oxygen. On the other hand, I could follow your lead of hydrogen as a reference to water, and reference CO2 as healthy, breathable oxygen. "The United Nations’ highest court on Monday ordered Japan to halt its annual whaling hunt in the Southern Ocean around Antarctica, saying that its present program was not being carried out for scientific purposes, as Japan has claimed." I've noticed when reading various blogs - that people always say you need to watch the pea, when it comes to the climate science. Thus the pea currently resides under cup 4 above. Am I getting the hang of "climate pea watching", or does it reside elsewhere? Seems as though they're just asserting that the climate is not primarily influenced by nature but by Mann. Brilliant, Josh. It's amazing how large a point you can make with just a few lines, some color and a few words. theduke: My thoughts exactly as I saw this image. Stunning. Witty. Truthful. Not a bad effort a pea watching, you now have your "Pea observer 101 badge" Your next exercise, should you wish to continue, is to predict when cups 4, 5 and 6 will appear and in which of those cups the pea will be hidden. You also have to watch for the third arm and hand to mysteriously appear and remove cups 1 through 4, and also correctly identify the body the arm belongs to. This exercise can be hard on ones sanity but highly rewarding. It seems the public are not concerned - report here. "the distinction between carbon and CO2"
James P, one of last week's scares on BBC news concerned the dangers of a "high Sodium" diet, by which I understood them to mean a diet high in Sodium Chloride. I absolutely hated Chemistry (too smelly and occasionally painful) but even I can remember that there is an important difference between an element and a compound containing that element. I can only imagine that they think it sounds more "scientific" and therefore less contestable to lay the blame on an element. Sky MSM ratcheting up the fear, without asking any meaningful questions - lucky that people in Somerset Levels were allowed some say, otherwise Monblot saying we have to accept flooding because there is a lot of water (thus ignoring the water management practiced there for centuries) went unopposed. and this will mean disaster. No caveats, measurements or benefits, nevermind meaningful questions. Apolog for spelling/grammar - picking at small screen to type. Guess the end of the world isn't THAT important after all. Thanks Josh. Without your cartoons these idiots would thoroughly depress me. If you only follow main streem media in a country like Sweden you will not understand this cartoon. Our hard working science jounalists have either not got the message of the working group or are deliberately obtuse. Great stuff, Josh. And yes, the alarmists are returning in force (in much of the UK media, anyway) - I've been following the story on the BBC News channel for much of the day and with the exception of Richard Tol, the people interviewed have decidedly been of the "worse than we thought" persuasion. Just been listening to Tim ("food miles") Lang on how climate change he says is going to impact on "food security" and force us all to go for sustainable but more expensive food options. (I seem to remember a Guardian article of his where he advocates a bit of "choice editing for sustainability" - love that phrase). They're out in force today, all right. What's also quite amusing, in a way, is that the BBC have been showing just about every stock clip of climate-changey video footage they have, during the day, as a backdrop to the commentary. Storms, floods, dried mud, glaciers calving, traffic jams, chimneys billowing great plumes of water vapour made to look like evil black CO2, a helicopter scene that I think is from The Day After Tomorrow... During an interview with Chris Field, they've even just had brief footage of noted savant Banksy's "I don't believe in global warming" graffiti. Few or no polar bears, though, for some reason. Alex: I haven't watched any telly on WG2 but the static imagery from the Beeb is just the same: parched this or flooded that. 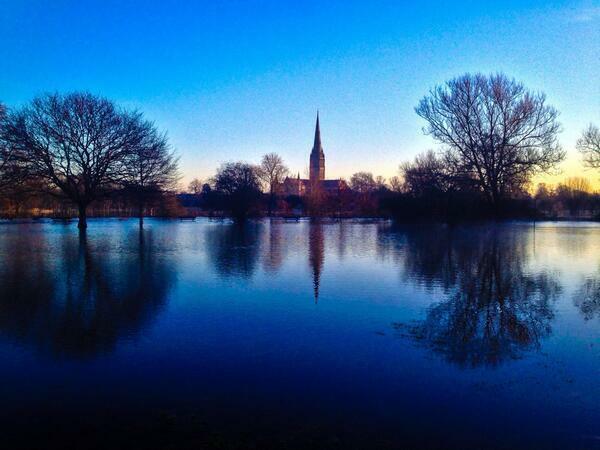 Even if they want floods why don't they try this of Salisbury recently. Because the beauty surely speaks of the wonder of man in harmony with nature, despite everything. (H/t Tom Holland, the warmist historian who lives there, by the way.) The repetition and lack of imagination in the coverage, after so many years of the same, contrasts totally with our friend Josh. When I saw the caption Climate Refugees I almost put my fist through the nearest wall. Yes. Don’t ask me to explain this. Try the authors. If you’re new to proxy reconstructions and don’t wish to become infuriated by appalling methodology, I suggest that you immediately forget that you ever heard of the topic. I read your comment on the peas and cups and thought you were well-versed at another level - climate misdirection. You are very welcome to chip and teach any of us who've been here a while. does anyone have contact details for Prof Walport, (e-mail or postal)? Another brilliant one by Josh. That the Report has been filled with uncertainty, retreat from previous claims, along with the usual bluster and lack of credible evidence will pass the MSM by (for the moment); but the general public has been hearing this for 30 years now, and has put 2+2 together without needing to "adjust" the answer to 8.015. Soon the MSM will turn, indeed are turning if The Guardian is a guide. Then look at for refugees desperate for a safer position. All this alarmism, yet all the models are flawed, the scientists don't understand why there is a pause, they can't quantify the contribution of natural effects in the recent warming, they can't model clouds, they have underestimated negative feedbacks. The science is a total mess and they want to silence those who point that out; and they wonder why they have zero credibility? Richard, I was struck by that exchange and Steve's response also. I think he crossed a line there, in a good way. It's the first time he's given voice to full-throated contempt for these people and their methods. He's been mocking and sarcastic before, but the use of the word "infuriated" there is telling. Yes, beware the wrath of McIntyre. You can't accuse the ABC of not spelling out the upcoming catastrophe in intricate detail - Climate change will impact everything everywhere. For those who sign up to panic within the next seven days, the ABC will forward two free tickets to see Noah. Terrific cartoon, right up with Josh's best! Sad to admit, but I am a climate refugee. Although a Kiwi, I would have been happy to settle permanently in the UK as it seemed to fit me. It was lovely catching up with various distantant relatives whose Grandfathers never had the wanderer's gene in their blood, but after a few years it became really obvious that without a large income, way above the level of my pension, I would eventually be in danger of hypothermia in the Winters due to the UK's bizarre energy policies, so I scuttled back to NZ where I can enjoy a similar lifestyle as the one I enjoyed in the UK and at a similar cost and remain warm My wife and I live in suburban West Auckland, where the mild winters suit us and the energy costs are a fraction of those which our daughter and her husband are now paying in suburban London for a similar habitation and lifestyle to us . We still miss the 'buzz' of living in London, but bi-annual visits there during the NH Summer will have to suffice and it is very pleasant to spend the bulk of the year in tee shirts, shorts and sandalls! Once again Josh you put a big smile on my face ! Why did none of the 'doomy-voiced' media anchors ask Walport/Davey/other 'expert' - if CO2 is so devastating for crops, why do tomato growers inject it into their polytunnels..? 'Wolf..!' cried the little boy. 'Bigger wolf..!' cried the little boy. Still no-one took any notice. 'HUGE wolves - hundreds of 'em..!' cried the little boy. They inject CO2 into the polytunnel to increase the natural warming, as CO2 holds the heat. Or is the theory wrong?